It's Alive is a 1974 American horror film written, produced, and directed by Larry Cohen. In the film, a couple's infant child turns out to be a vicious mutant monster that kills when frightened. Notable talents involved in the movie were Bernard Herrmann who composed the score (noted for his work on many films of Alfred Hitchcock) and Rick Baker for makeup and puppet effects. In Los Angeles, Frank Davis (John Ryan) and his wife Lenore (Sharon Farrell) are expecting their second child. Frank is a successful public relations consultant and his wife is a stay-at-home mom for their first child, Chris (Daniel Holzman). The couple avoided having a child for several years while Lenore took contraceptive pills. When their child is ready to be born, they leave Chris with a family friend, Charley (William Wellman, Jr.), and go to the hospital. Their second child, a baby boy, is born monstrously deformed, with fangs and claws. Immediately after birth, one of the doctors attempts to suffocate the child. The child kills the doctors and nurses and flees through a skylight. Lenore is left alive, screaming for her child as a horrified Frank discovers the carnage. Frank and Lenore are allowed to leave the hospital while the police investigate the killings. Unknown to anyone, the child travels to the Davis home, and kills anyone he encounters. As the killings continue, the press and the police hound Frank and Lenore. When talking with medical researchers investigating the case, Frank is reminded of watching Frankenstein and Karloff's portrayal of the monster. He sees the child as symbolic of the monster and comes to see himself as Dr. Frankenstein, the true monster who created and abandoned the creature. Frank denies the child is his son, and joins the hunt for the murderous infant. The doctor who prescribed the drugs to Lenore is contacted by a pharmaceutical company executive. The executive acknowledges that the child's mutation may have been caused by the drugs. He tells the doctor that the child must be destroyed to prevent discovery of the company's liability. The Davis infant reaches the Davis home. Lenore embraces the child and hides him in the basement. Chris becomes homesick and runs away from Charley's house. Charley follows him. Frank discovers that Lenore is hiding the infant. Lenore desperately defends her child and promises he would not hurt the family. Frank then takes a gun into the basement to kill the infant, but he finds Chris talking to him and promising to protect him. Frank shoots at the child and hits him. The infant then flees the basement, and attacks and bites Charley on the neck, killing him. Frank shoots again. Lenore hysterically tries to stop Frank, and Frank tries unsuccessfully to reason with her. The police track the infant into the sewers, where Frank hunts him with a rifle. When he finds him, he realizes that the child is frightened and will not hurt him. He apologizes to the child and picks him up. Wrapping the baby in his coat, Frank tries to elude the police, but a mob of armed cops confronts him as he exits. He pleads for them to study the child but not hurt him. The fertility doctor screams at the police to kill him. The child suddenly leaps from Frank's arms and attacks the doctor as the cops open fire, killing both the infant and the doctor. As the Davises are being taken home by the police, the detective in charge receives news that another deformed baby has been born in Seattle. The film had a complicated release through Warner Bros. beginning in 1974. It was reissued in March 1977 with a new advertisement campaign. The new 1977 TV advertisement showed a baby carriage with the music Rock-a-bye Baby playing, then a claw came out and a voice-over said, "There is only one thing wrong with the Davis baby. It's alive". The new ad drew people into theaters, ultimately earning Warner Bros. $7.1 million in U.S. domestic rentals. On Rotten Tomatoes, the film holds an approval rating of 72% based on 18 reviews and a weighted average rating of 5.9/10. On Metacritic, which assigns a normalized rating to reviews, the film has a weighted average score of 72 out of 100 based on six reviews, indicating "Generally favorable reviews". Vincent Canby of The New York Times wrote, "Mr. Cohen is not unintelligent, but the few interesting ideas in his horror films, including the recent 'Demon', are drenched in supreme silliness by way of the dialogue and special effects." Variety called it a "stomach-churning little film", praising Herrmann's "highly effective" score but also criticizing the film's script as being too far-fetched. Gene Siskel of the Chicago Tribune gave the film only one star and slammed it as "imbecilic." Kevin Thomas of the Los Angeles Times called it "a sort of primitive low-budget sequel — rip-off may be the better word — to 'Rosemary's Baby.' Despite patches of risible dialogue and other ludicrous bits and pieces it holds attention and even manages to be pretty scary." Tom Milne of The Monthly Film Bulletin was fairly positive, writing, "Attitudes to horror films being what they are, it's a fairly safe bet that John Ryan won't get the credit he so richly deserves for an outstanding performance which brings It's Alive within striking distance of Night of the Living Dead. Author and film critic Leonard Maltin gave the film two and a half out of four stars, commending the film's score while also writing that it wasn't for all people's tastes. TV Guide awarded the film 3/5 stars, writing, "Part visceral horror flick and part Oedipal allegory, It's Alive explores a widely repressed but crucial element of family life–parents' ambivalence toward their children–and satirizes society's cavalier treatment of its youngest members, prefiguring the mean social policies of the American 90s." Time Out wrote, "Despite such potentially sidesplitting material, the film often manages to instil a genuinely chilling atmosphere, with its initially kitsch family growing into human beings as they plummet into a world unhinged and apart at the seams." Dennis Schwartz of Ozus' World Movie Reviews rated the film a grade A, praising Ryan's performance, and called it "a wacky low-grade entertaining horror pic, one that also has an edge, is discomforting and surprisingly has a good blend of humor and splatter." The novelizations of the first film and its sequels expound on the dangers of various prescription drugs administered to expectant mothers during the 1950s and early 1960s (e.g. Thalidomide), the use of fertility drugs, and the indirect use of pesticides on people. In the story, the mother of the first mutant child had a history of taking combined oral contraceptive pills prior to planning her second pregnancy, whereupon she instead began taking an inadequately tested fertility drug to facilitate the conception of her second child. 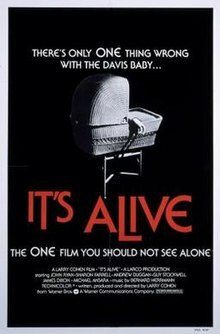 The film was followed by two sequels, It Lives Again (1978) and It's Alive III: Island of the Alive (1987) and a remake, It's Alive (2009). ^ "At the movies". Chicago Tribune. Section 6, p. 15. April 21, 1974. "...opening Friday at the Woods Theater." ^ "Movie previews". Chicago Tribune: 21. April 27, 1974. ...having its world premiere at the Woods. ^ a b Litwak, Mark (1986). Reel Power: The Struggle for Influence and Success in the New Hollywood. New York: William Morrow & Co. p. 251. ISBN 0-688-04889-7. ^ Wilson, William S. (2014-10-19). "Mutant Baby Turns 40". Video Junkie. Retrieved 2014-10-18. ^ "It's Alive (1973) - Rotten Tomatoes". Rotten Tomatoes. Flixster. Retrieved 10 October 2018. ^ "It's Alive Reviews - Metacritic". Metacritic.com. Metacritic. Retrieved 5 October 2018. ^ Canby, Vincent (April 28, 1977). "Absurd Baby Murderer". The New York Times: 76. ^ "It's Alive – Variety". Variety. Variety Staff: 16. October 16, 1974. Retrieved October 10, 2018. ^ Siskel, Gene (May 1, 1974). "Baby, 'Alive' is Deadly". Chicago Tribune. Section 2, p. 9. ^ Thomas, Kevin (October 16, 1974). "A Second Child Who Was Born to Be Bad". Los Angeles Times. Part IV, p. 14. ^ Milne, Tom (June 1975). "It's Alive". The Monthly Film Bulletin. 42 (497): 137. ^ Leonard Maltin; Darwyn Carson; Luke Sader (2 September 2014). Leonard Maltin's Movie Guide 2015: The Modern Era. Penguin Group USA. p. 716. ISBN 978-0-451-46849-9. ^ "It's Alive - Movie Reviews and Movie Ratings". TV Guide.com. TV Guide. Retrieved 5 October 2018. ^ "It's Alive, directed by Larry Cohen". Time Out.com. Time Out London. Retrieved 5 October 2018. ^ Schwartz, Dennis. "itsalive". Sover.net. Dennis Schwartz. Retrieved 5 October 2018. This page was last edited on 16 April 2019, at 08:11 (UTC).